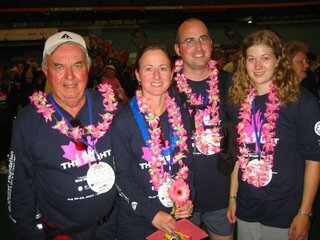 This is a photo from two years ago, when (from left) my dad, my sister, brother and Michelle participated in the "Weekend to End Breast Cancer" in Vancouver. I find it kind of hard to express how I feel about people who will walk 60 km in a weekend for any cause, and then most especially as it relates directly to me and to breast cancer. I find it very humbling and overwhelming. At any rate, I am proud to know so many people who are again doing the walk this year. Michelle volunteered as 'crew' for the Winnipeg walk..... my sister, brother, sister-in-law and my niece Heather are all walking in Vancouver this weekend. Many friends are also walking in Calgary, Edmonton and Toronto, as is my cousin Erin (Toronto). I send my congratulations and heartfelt thanks to everyone involved. Thank you so much for expressing these thoughts. We registered this evening and are currently finalizing our packing. The "weekend" is an incredible experience and I, for one, feel so fortunate to be able to participate in it again. All four of us have received incredible support from family, friends,colleages and even complete strangers. I know that our feet will be tired, but we will be strengthened by your strength and determination and inspired by the goodwill of those we meet along the way. Keep up the good fight. We know that you will be with us every step of the way, as we try to be with you. I'm ready to walk 60 KM to find the cure for breast cancer! While i'm walking, I'll be thinking of you. I won't be thinking about all the walking on my poor feet but I'll be thinking that I'm making a difference and that hopefully we will find the cure for you. We just registered tonight, and I can't wait. It will be really fun. I love you and I hope that you'll be as happy as all the rest of us. I hope they come through their various walks tired but proud. No matter how far they walk it won't touch the spirit you show to keep on going with the treatment. It's a hard slog of a very special kind. Kudos to all who do whatever they can to raise money for breast cancer research (especially those who make that LONG 60 km walk). The walk in Calgary was very successful and it is amazing just how much money was raised. We hope a cure is coming; in the meantime scientific advances are the best we can hope for and we are grateful that they help with current treatments. However, the real heroes are people like you, Joanne, who have to endure chemotherapy and all the pain and uncertainty that goes with having this disease. So, kudos to you and your family. Your attitude is an inspiration to all of us! Thanks again for the update and we look forward to seeing you this week in Regina.